After marrying Lynton, Claire settled back into farm life and manages all the stuff Lynton doesn't want to do! 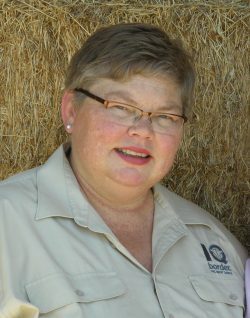 Claire spent her early years on a fruit block in the Riverland and then her family moved to a sheep and cropping property in the South East where she completed her schooling. After trying her hand at several jobs she settled into secretarial roles in South Australia, in Western Australia then back to South Australia before she met Lynton. After she married Lynton she settled back into farm life and provides that important role in the sheepyards, shearing shed or on the tractor when an extra pair of hands are needed. This is on top of her role as a mother and quality control for the bookwork and she really loves having a paper trail for everything. 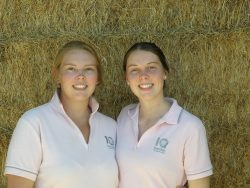 Ellen is studying Agriculture and Business at University in Armidale and Lauren has just finished school however they are both very keen and ready to roll their sleeves up when available. They have handpicked their own ewes that are run within the Inverbrackie flock and enjoy the responsibility, decision making and record keeping that goes with running their sheep and of course the reward when they sell their own rams. Eliza joined us at Inverbrackie in May 2018. She is a Taswegian at heart but her background is station work with Jumbuck at Coober Pedy and the Kimberlys. It has been a big change going from extensive sheep management to our intensive stud operation but she has good attention to detail and adds some youth and fitness to the day to day operations.